Before we get into the post I would like to take a moment to thank each and everyone of you who voted for WUHS at the Apartment Therapy Homies. Though we fell short of the 80 more votes needed to make the top 5 cut off, it has been worth every bit.I’m totally humbled by your support, love you all! Again THANK YOU from the bottom of my heart! That said, 3 of my favorite bloggers have made the cut so if you are still in the mood to vote please hop on over to support my friends; Kelly from View Along The Way, Julia from Cuckoo for Design, and Mandi from Vintage Revivals. After almost a week of near perfect weather it looks like we are heading back into the arms of Ol’ man winter. 🙁 How about you? I’ve had enough of winter already! 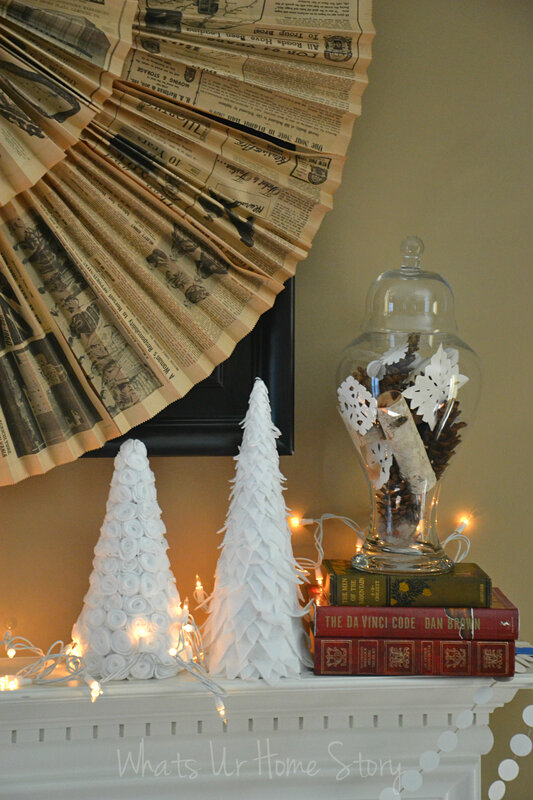 Just as I was about to pull down my winter decor last night I realized that though I’d shown you my winter mantel I never showed you how to make the felt tree! This is not necessarily a “winter craft” per se. Could use red felt instead to make a Valentine’s or Christmas tree or Green for St.Patty’s day or Pastel colors for Easter, Orange for Fall etc. 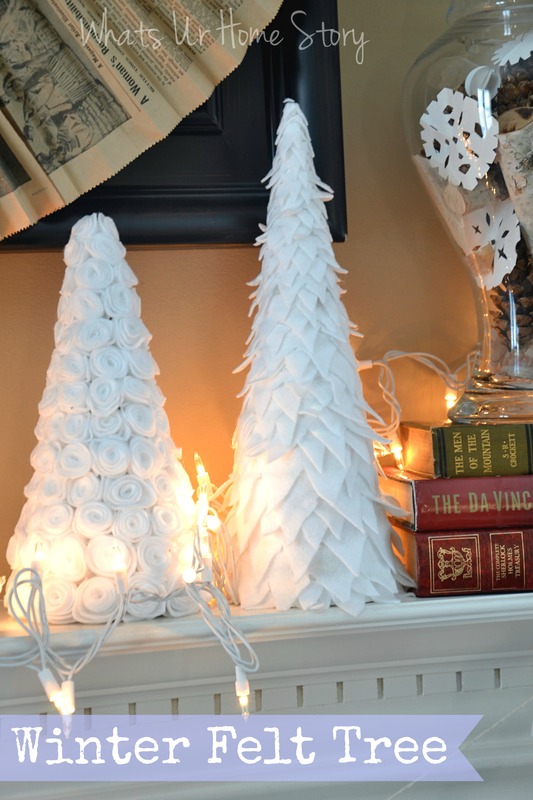 Whatever the holiday these are a sure fire decorative trick to add height to your mantel. I made both the trees myself but the one on the right is by far the easiest and most forgiving project I’ve done. On a side note, I burnt every finger of mine making the left one for my Etsy holiday store back in December, not something I want to make again or suggest to you. 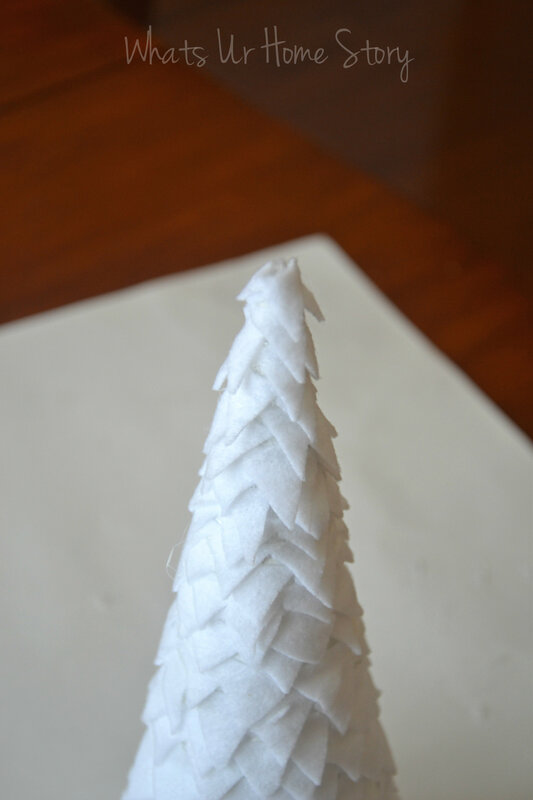 So here it is how to make the tree on the right. White craft paint and brush – not necessary but if you are a sloppy crafter like me you’ll need it. 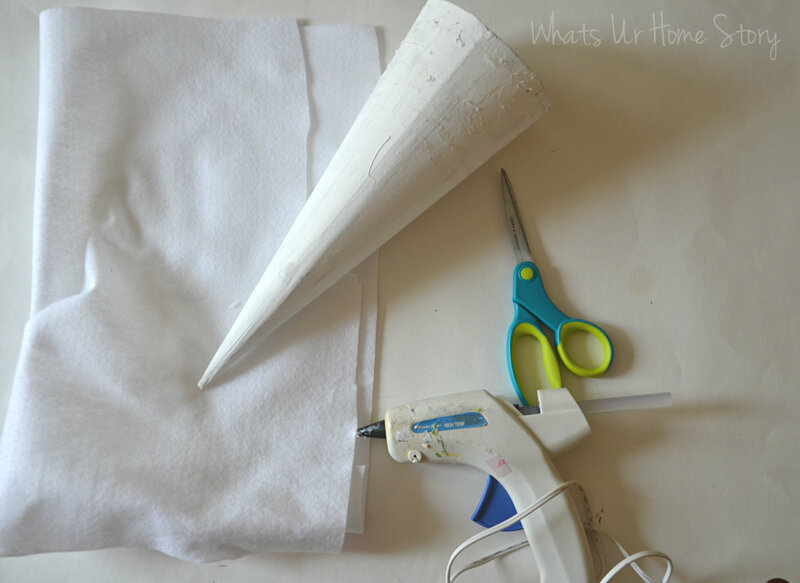 Start by painting your brown paper mache cone white with the acrylic craft paint. This way the brown base will not show through any hot glue misses later on. 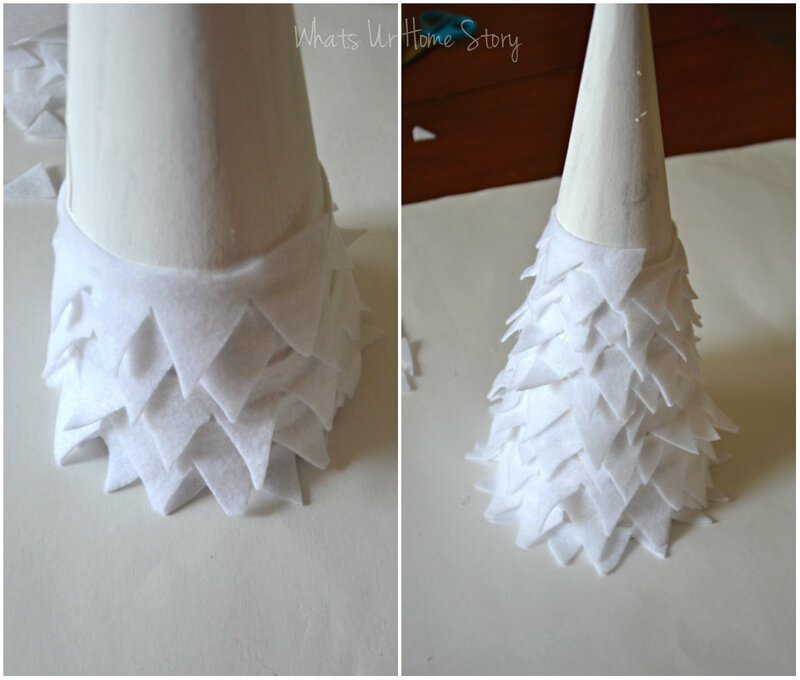 If you are using a poster board cone, skip this step. 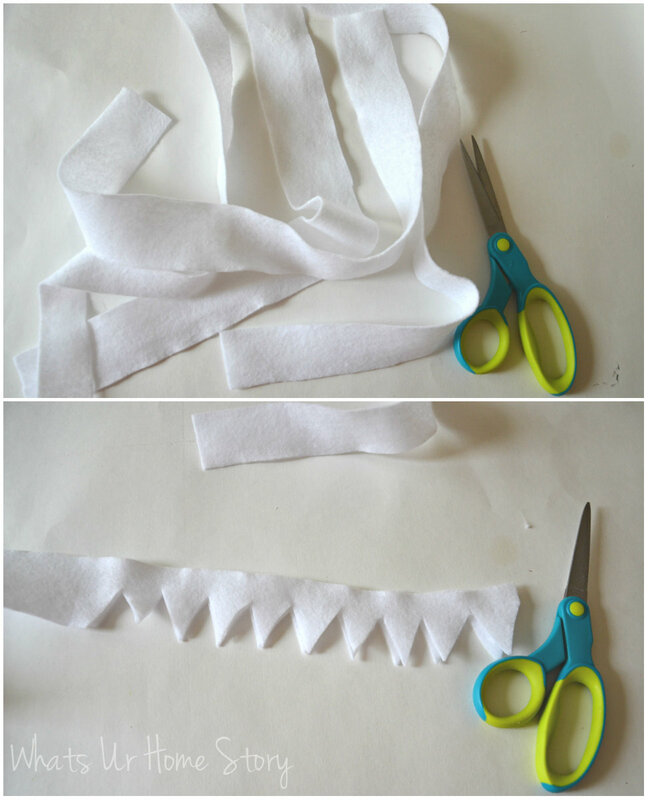 Cut felt strips in varying widths. My cone was 14″ tall. So I ended up using four 1 inch strips, two 3/4″ strips, two 1/2″ strips, and a small 1/4″ strip. It is important to lower the width of the strip as you go up the tree to simulate the look of smaller leaves on the top and wider leaves on the bottom. These are not exact measurements, I just eyeballed them. Cut out triangles on one side of the strip as shown below. Take care not to cut all the way through. Again no need to be precise here, just free hand. 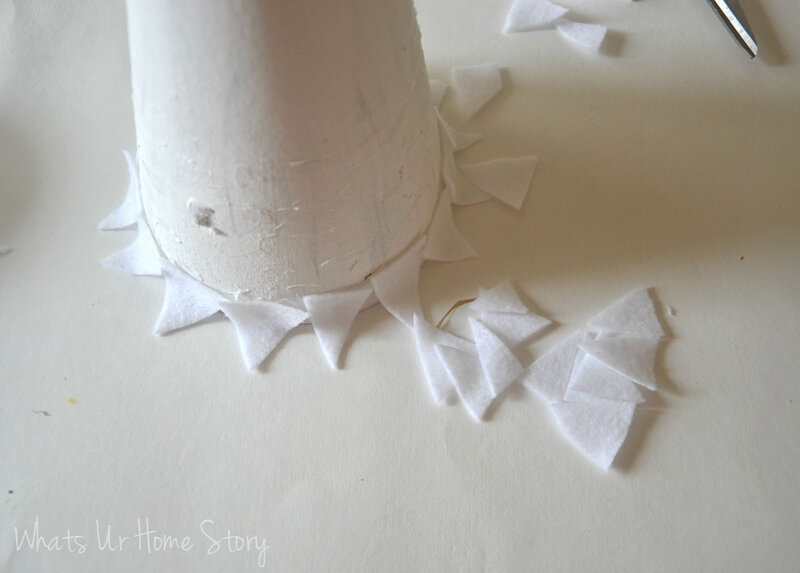 When you make these you will end up with a lot of felt triangles (the parts that you remove from your strip). I didn’t want to waste these so for my first layer on the tree I hot glued each of these to the base. If you are not a fan of gluing each petal down you can start with the strip instead. From then on hot glue each strip around the tree making sure there is some overlap between the layers. Remember to switch to the thinner strips as you go up the tree. When you reach the top cut the extra felt off and carefully hot glue the felt to cover the pointy top. No worries if there are any empty spots where the paper cone base is visible. You can use the extra triangles that you removed when you made the strip intially to cover up these spots. Gently fluff up the ‘leaves’ and you are done! 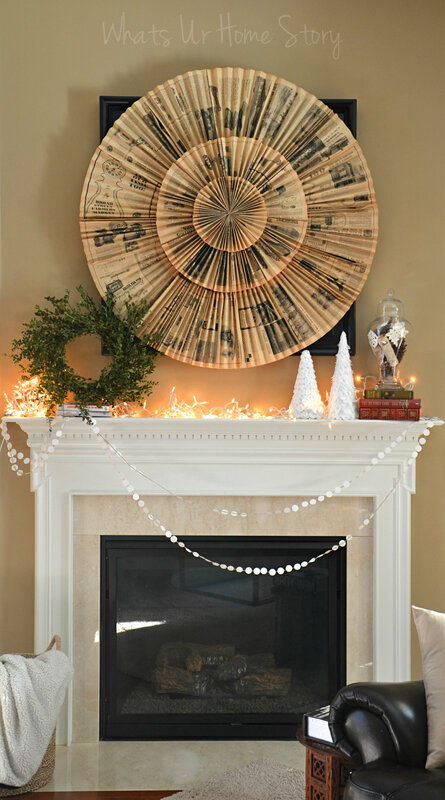 Here’s it is adding glam to my rustic winter mantel. And that officially marks the end of all winter posts on WUHS this year, I promise! Even if we are gonna be buried in a foot of snow I’m going to live it up like Spring is here already. Are you more than ready to welcome Spring too? How bad has the weather been in your neck of the woods? These look super cute! I will have to add them to my “to make for next winter” list! Thank you. 🙂 Yup I’m so done with this winter! Amazing how sophisticated the results are from just felt, well done! Very pretty! I love the rosette tree!